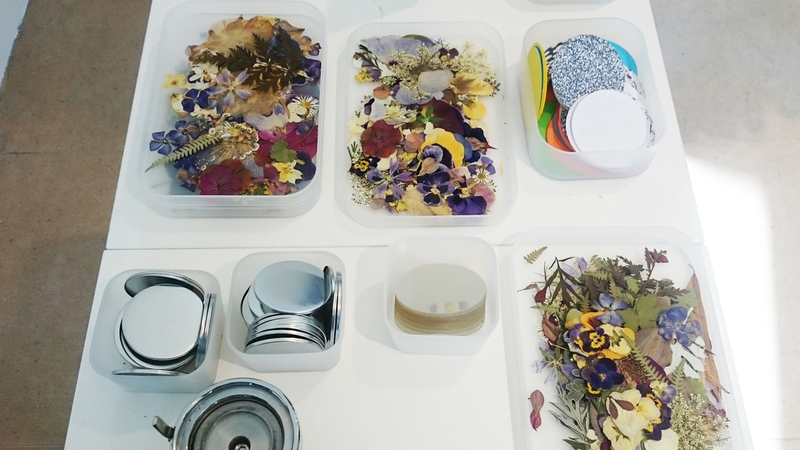 Badge Making with pressed flowers and is an ideal activity for events such as weddings. We can provide badge making at your event in Ireland using flowers. Using pressed flowers is an approach that works particularly well for weddings. We've found that men are sometimes not keen to use flowers so leaves and ferns can be used as in the example below. We can customise the approach to badge making to suit your theme and audience .We have hosted badge making events using a variety of other methods such as drawing, stamps, stencils, stickers or any other way of putting something onto paper. BadgeMaking.ie recently provided badge making as an activity for the visitors to a press event at River Island. The event involved guests making their own 58mm badges using pressed flowers. We decided to make demo video showing how the process works. Badge making is an ideal activity for events such as weddings. We can provide badge making at your event in Ireland using flowers or other methods such as drawing, stamps, stencils, stickers or any other way of putting something onto paper. The video is below. BadgeMaking.ie was invited by River Island to facilitate badge making with pressed flowers at their High Summer press event. Grafton Street. Flowers were used to tie in with the use of floral print in their new clothing lines. It was a great day and some lovely badges were made by the bloggers and members of the press. Two badges using real pressed flowers. You can find more info on badge events here. A video of one of our Badge to the Bone events where we offer the opportunity to design and make your own badges. It's great fun for all ages.